Michael Portman has heard his salon customers share information with their hairdressers that they wouldn't confide in anyone else. As he says, it's a business built on trust. After all, how many deals compel the service provider to wield a sharp pair of scissors to your scalp or neck? 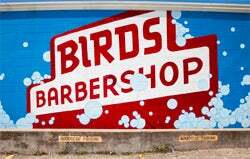 Today, six years after he and childhood pal Jayson Rapaport opened the first of five Birds Barbershops in Austin, Texas, Portman is especially pleased when a customer comes in for a haircut in advance of a job interview. "That's a pretty trusting moment there," Portman says. Like many entrepreneurs, Portman has found that savvy branding efforts go a long way toward cultivating that trust. And while there's no single formula for branding your way into a client's warm embrace, it's generally agreed that it takes more than a clever slogan or a catchy jingle. At the very least, it takes strong job performance, effective marketing (often online) and favorable public opinion. Yet experts say building trust through branding also requires an ineffable something that leaves customers feeling good about the whole exchange. "Branding now is trying to measure not just the affinity, but the trust a consumer has in you," says Todd Copilevitz, a branding consultant in Atlanta. To build trust through branding, says Karen Post, a Tampa, Fla.–based consultant and the author of Brand Turnaround, an entrepreneur must establish a distinct identity. Portman and Rapaport did this by offering standard haircuts at below-market prices--$19 for men, $39 for women--and keeping salons open seven days a week. ("Every salon in the world is closed on Mondays," Portman says. "What's with that?") Tapping into Austin's rich musical heritage, they installed old-fashioned jukeboxes, then turned up the volume. 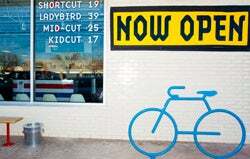 Because Austin is such a bicycle-crazy town, they offered men who rode to Birds a free hair wash. (Women get a shampoo with the standard cut.) And abiding by the company ethos of keeping things local, they formed myriad partnerships in support of hometown causes and events. Their mission was simple, really: They wanted to make the haircut experience more fun. And that's where the beer comes in. After noon each day, anyone who gets a haircut at Birds receives a free can of Shiner beer. Birds pays nothing for the beer but gives Shiner plenty of promotional punch, including a neon sign in every salon window. Shiner comes from the Lone Star State's oldest independent brewery, so it holds a special place in the hearts and minds of Texans. For Portman, the arrangement has been invaluable in helping Birds establish its identity. And that has led to success. Last year, Portman says, Birds took in nearly $3 million in revenue. Birds has relied heavily on social media to build its brand. Copilevitz says the online world, which gives consumers a robust and timely forum for expressing opinions, has forced businesses to revert to old-school customer service. "That is, dealing with people as people," he says. "They're using social media to talk to their customers in an open, honest way, and they do that on a stage where millions of eyeballs can focus on that discussion." Using social media effectively, adds Portman, also means knowing when to lay low. "We're part of the conversation, just like when you're sitting around the table with friends," he says. "You don't say anything unless you have something to say."